If you are like us, you love pizza. Last Friday, I decided to try a dessert pizza and I have to tell ya, I will be adding one quite often to our pizza nights. Did you know you can find several Rhodes Bake N Serv and Anytime products at Publix? Yes, I know! I love shopping and finding my favorite, go to frozen bread products there. Stop by your local Publix to pick up Rhodes Bake N Serv White Bread Loaves to make this Apple Pecan Dessert Pizza and so much more. 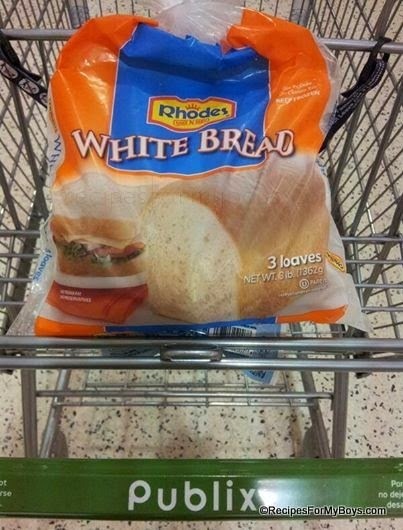 I love finding my favorite go to, Rhodes Bake N Serv White Bread Loaves, at Publix! One loaf made a 14" dessert pizza with a thin crust. You can absolutely do this in a 12" pizza pan with a slightly thicker crust. Try making dessert pizza with different fruit fillings, nuts, dried fruit and/or granola. The right side was for my icing lover. Please stop by Rhodes to see my recipe for Apple Pecan Dessert Pizza along with other great recipes. Don't forget to visit My Rhodes' Pizza for everything pizza!